Ленинад (Leninade) INC. ®, founded in 2000 by Gorbunkov Prokhor Denisovich, a former Red Army Colonel who settled-down in the States after the Third Pacific War; is a soda production and distribution company subsidized by the Pan-Asiatic States and operating in the Pan-Asiatic States. Leninade is dedicated to liquifying the essence of a violent proletariat uprising and bringing it to every street corner. The refreshing taste of a crisp bottle will level out even the most bourgeois of people and incite them to rebel. The company has its roots in the classic LENNINADE Soviet-flavored soda drink but has since branched out to include many other flavors, which can be found below. The company is not responsible for any sudden urges to overthrow the government after the consumption of any of the LENINADE INC. ® products. Last edited by Pan-Asiatic States on Tue Apr 16, 2019 7:56 pm, edited 8 times in total. Ленинад (Leninade) INC. ® creates each unique and powerful flavor by draining the raw essence out of indoctrinated Asian Communist Youth League members. While Leninade REVOLUTION RED ® (Classic) is statistically the most predominant and favored beverage, with its spicy-citrus mystery ingredient having burned many a teenagers' throat, other drinks such as Juchejuice and Trotsky Iced Tea tend to have their own cult followings as well for their uniquely 'energetic' flavors. According to The Huffington Post, the "flavor isn't really Leninade's selling point. It's the Soviet puns stamped to the bottle's label". The slogans on the bottle make fun of Soviet phraseology and propaganda, with phrases such as "A Taste Worth Standing In Line For! 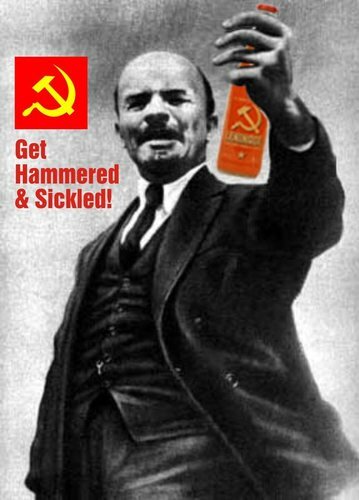 ", "Get Hammered & Sickled! ", "Drink Comrade! Drink! It's This or the Gulag!" and "War is Best Served Cold". Katharine Shilcutt of the Houston Press described Leninade as being "like pink lemonade with just light carbonation. I really enjoyed it ... It's a light, fun summer drink to be served with a wink and enjoyed with tongue firmly planted in cheek". In a review of Leninade, Steve Tanner of BevReview said, "The bottle is a nice keepsake by itself, as the graphics are printed directly on the glass ... The bottle itself does not describe the flavor, and upon the sip, it's rather hard to place. There are elements of lemon, citrus, cherry, and grapefruit… at least that's what my tastes buds were saying. ... The non-traditional flavor profile helps it stand alone both in positioning and taste. Leninade is as unique as finding an Eastern Bloc Olympic athlete not using steroids. Recommended!" Wanna buy some LENINADE INC. ® products? Last edited by Pan-Asiatic States on Sun Apr 14, 2019 10:36 pm, edited 7 times in total. Ленинад (Leninade) INC. ® also offers Vending Units for sale across all countries, with free monthly maintenance and free shipping. LENINADE INC. Vending Units cost just 151.99 NSD each, and can be shipped to any location, any time, anywhere, instantly. Modeled after the vending machines of Coke and Pepsi, LENINADE INC. Vending Units give off a proletariat vibe that attracts customers to machines like Red Guard echelons to Tienanmen Square. Want LENINADE INC. ® products available for purchase in your nation? Last edited by Pan-Asiatic States on Sun Apr 14, 2019 10:37 pm, edited 4 times in total. Ленинад (Leninade) INC. ® partners itself with various other companies, groups, and organizations in the spirit of comradeliness and good vibes. If you are a business, company, or organization that would like to partner with LENINADE INC. ®, then send in the application below. If you are a sports team that is seeking a sponsorship from LENINADE INC. ®, then please send in the application below the first one. Last edited by Pan-Asiatic States on Sun Apr 14, 2019 3:59 am, edited 2 times in total. Your vending machines are on the way! Additional comments/concerns: We will split the profits on Leninade’s discretion but will not accept anything below 30% profit intake for our company. Last edited by Indosekai on Sun Apr 14, 2019 7:57 am, edited 1 time in total. Your products are on the way! We hope to continue our mutual prosperity in this endeavor! We will ensure that 60% of each bottle's profit will go to RC Cola, 40% will be maintenance, distribution, and manufacturing cuts on par with LENINADE INC.
Last edited by Gagium on Sun Apr 14, 2019 8:48 am, edited 1 time in total. A Pan-Asiatic C-390 will air freight your products. Enjoy a refreshing of taste of realpolitik! Due to the high acceptance of the product, Estado Liquido requests to increase our order to 70000 machines. Reino do Brazil wrote: Due to the high acceptance of the product, Estado Liquido requests to increase our order to 70000 machines. More vending machines are on the way! Xaxaxa! Name of  Recipient: Kwik-E-Mart Inc. Method of Delivery (Doorstep, P.O box, etc. ): doorstep, at our stores. Your products are on the way! Drink to the health of Communism! Last edited by Pan-Asiatic States on Thu Apr 18, 2019 2:05 am, edited 1 time in total. Nature of sponsorship (required): We would like enough Leninade to last us throughout the tournament, and in return we will wear jerseys with your logo on it. The tournament only last a few days, since there are a small number of teams (less than 6 overall). Additional comments/concerns: Your drinks are fantastic- redder than Prol Park- refreshing, and helping us STICK IT TO THE BABYLONIANS! Last edited by Bruke on Thu Apr 18, 2019 2:28 am, edited 1 time in total.